We are officially 107 sleeps away from Christmas. Some of you are giving me serious side eye because we just celebrated Labor Day. Like, it’s still 90 degrees here and I’m talking about Christmas. I know, I know, don’t leave yet though!!! Whether this is your first holiday season offering products or services or you’re a pro, the process can end up being a bit daunting. So how do you do it if you don’t have a team? The key is to start NOW. Decide what you’re going to offer. Take a piece of paper and jot down Wednesday, Thursday, Friday, Saturday, Sunday, Monday, Tuesday. Jot down the offers, products, discounts, etc. you can offer from the day before Thanksgiving through Give Back Tuesday. This list may adjust over the next few weeks, but it’s important to have a place to start. Survey customers and clients. What are your customers’ or clients’ favorite products or services? This may be a good “no brainer” to add to your holiday offers. What is on your customers’ “wish list?” This may help you create something to offer as an “exclusive” or something new during the holidays. Unless you are just starting and do not have any customers, there is no use in you scratching your head on all that you can offer. Allow your customers’ to help you. Offer advertisement to list and group. Not everyone “sells,” but a lot of you have communities or groups you can offer businesses access to your communities to advertise their holiday offers. Think of a package(s) you can offer to business owners in your group and others for you to advertise to your email list or group. Create and grow a FB group. If you’re interested in building a community, now is a good time to start. But it’s important that you define and create a group that offers true value, not just a means to get emails or a captive audience to sell to. Grow email list. Have a graphic created encouraging people to join your email list. If you need some ideas on how to increase your email list (and its readership), check out my Maximizing MailChimp masterclass. Seed sale. In order to get some items for your holiday sales season, consider a “seed sale.” This is a sale where the profits from a particular sale or sales of a particular item go toward the packaging, graphics, supplies, etc. you need for the holiday sales season. Build and create an affiliate program. Expand your reach by creating an affiliate program. Now is a good time to do it so you can work out kinks and orient people to you and your brand. Create a conglomerate. Work with other brands and start cross promoting each other and your holiday offers early. Another way to expand your reach. Build your own affiliate relationships. If you’re a content creator, you can get in on the coins game by joining affiliate networks and relationships. Then you can promote your favorite brands and hopefully earn some coins at the same time! Amplify your voice and presence. Post more on social media. Email your list more (at least weekly). and Connect more (online). You can’t wait until the week of Black Friday to start posting, emailing, and connecting. Start now and watch your audience grow! 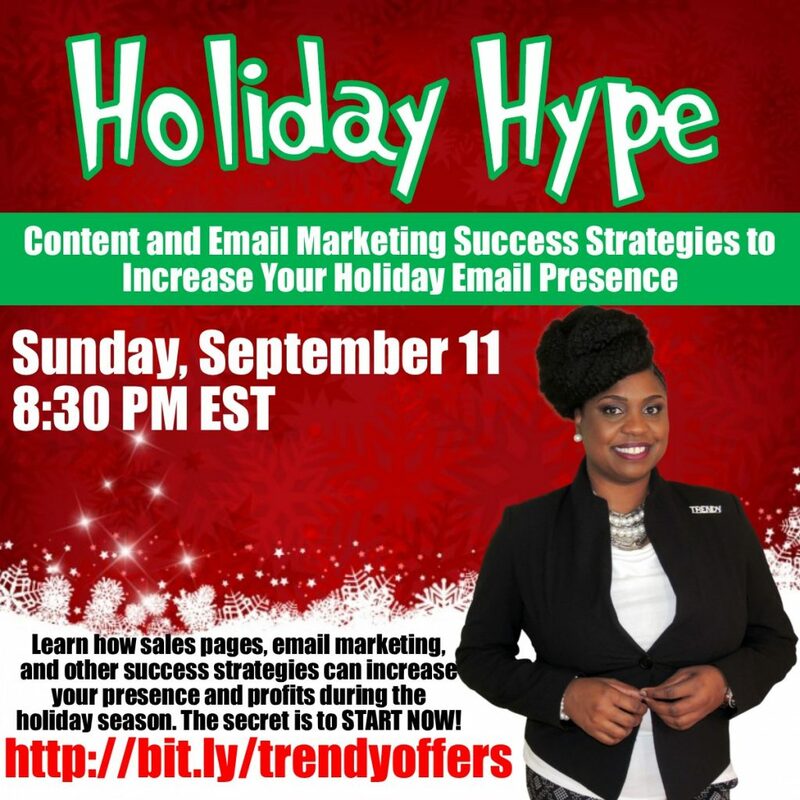 These tips and so much more will be covered in the Holiday Hype Marketing webinar this Sunday! You can register here (do not close out before PayPal redirects you to the webinar registration page).